The Daimler V8 250 was the last production car to use the famous Daimler V8 engine. When Jaguar bought Daimler in 1960, they not only acquired another factory but also access to Edward Turner’s wonderful V8 engine. 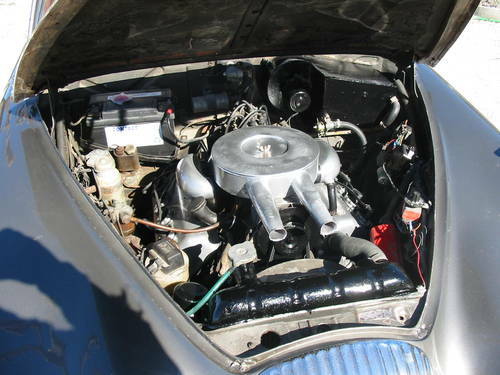 Originally used in the Daimler Majestic Major and the SP250 convertible, the 4.5ltr and 2.5ltr engines were lighter than Jaguar’s own straight six engines. Turner, who designed Triumph motorbike engines, brought his expertise to the Daimler engine, designing the hemi head and employed domed pistons much like in his Triumph bikes. The 2.5ltr engine produced 140BHP making it more powerful than the Jaguar 2.4ltr straight six. When Jaguar acquired Daimler, the SP250 convertible was dropped and its engine was tested in the new Jaguar MK2 body. It was found to be an excellent fit and so the Daimler V8 250 was born. 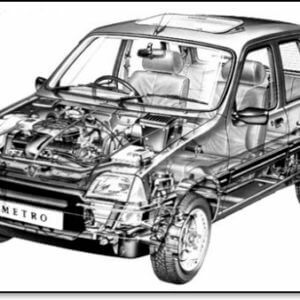 Four speed manual and two speed Borg Warner automatic transmissions were offered with most saloons specified with automatics. Power was sent to the rear wheels and disc brakes were fitted as standard. The V8 250 was positioned between the MK2 2.4 and MK2 3.4 and was marketed as a more luxury alternative. 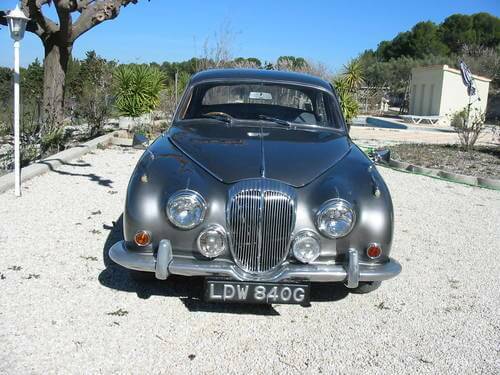 Production lasted from 1962 to 1969 and was the last Jaguar car to be linked to Daimler engineering. The Daimler V8 250 on offer is a 1968 model and has the rare and desirable manual transmission with overdrive. 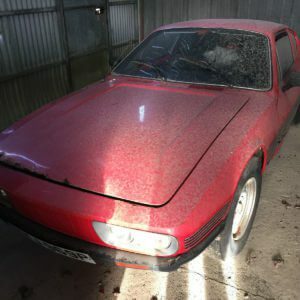 It is described as being a matching numbers car and is in good condition. The current owner has had the car since 2007 and in that time has had the bumpers re-chromed and new carpets fitted. New door cards have also been fitted. The seller notes that it has been kept in a dehumidified garage. Mileage is 77,687 and the seller believes this to be correct but it is not said whether this is backed up by any documented history. The unmistakable front end of the Daimler V8 250/Jaguar MK2 body. The grill and badge helped distinguish the Daimler from the Jaguar. This 1968 has the correct slim bumpers and Daimler badged hub caps. Twin exhausts suited the Daimler V8. Lashings of wood and leather make the interior a lovely place to sit. That engine! Very underrated which is a shame. This Daimler V8 250 looks to be in nice shape. The opalescent silver paint was always a nice colour on the MK2 body and contrasts well with the blue interior. 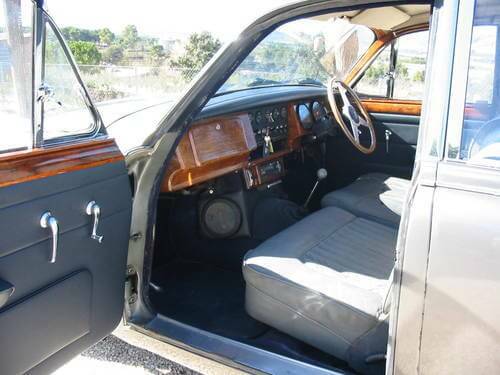 It is hard to tell from the photos but the wooden dash looks to have a nice shine to it, as do the door cappings. 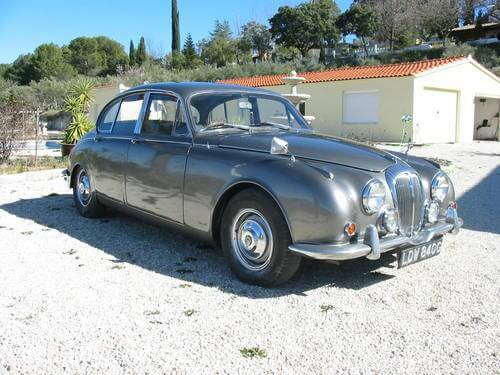 Restoring the wood trim on a Daimler or a Jaguar is not cheap, so if this is in good condition, that is a bonus. What looks like a wood rimmed Mota Lita wheel has been fitted which is a common upgrade over the stock wheel. The seller notes that the seats have been freshly dyed so we assume they are in good condition. However detailed photos are not provided. While it is mentioned that the bumpers have been re-chromed (which is a good thing! ), nothing is said about the condition of the rest of the chrome. These cars have lots and lots of chrome so can be quite costly to redo. Looking at the rear there are two small holes below the bumper which suggest a tow bar was fitted in the past. The engine bay looks to be in reasonable shape for a forty seven year old car. The rocker covers and the SU carb pepper pots can polish up quite nicely and can really smarten the engine bay. The lack of a visible power steering drum suggests this model wasn’t fitted with power steering when new. 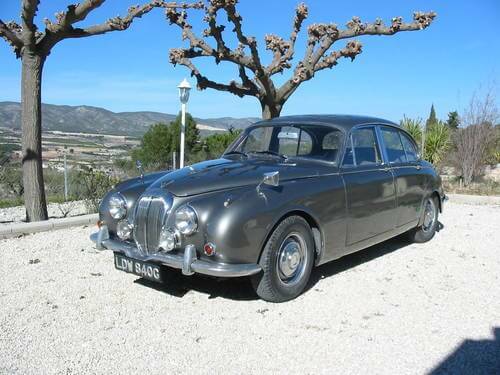 We used to own an automatic Daimler V8 250 and always felt they have been over shadowed by their Jaguar brethren. It was a lovely car to drive and the V8 engine was one of the sweetest we have ever heard. We actually prefer the burble of the V8 to the Jaguar straight six and would have it over the 3.8ltr MK2 any day. Most people recognised ours as an Inspector Morse Jag which always made it a talking point. Occasionally a true petrol head would correctly identify it as a Daimler. We’ve never driven a factory manual before and would love to see how it compares to the automatic. It must sound awesome to be able to hold that V8 through the gears. With only two hundred or so factory built manuals, this 1968 Daimler V8 250 is a rare car. Which goes some way to explain the £17,750 asking price. For that price we would expect this V8 250 to be in excellent, rust free condition. 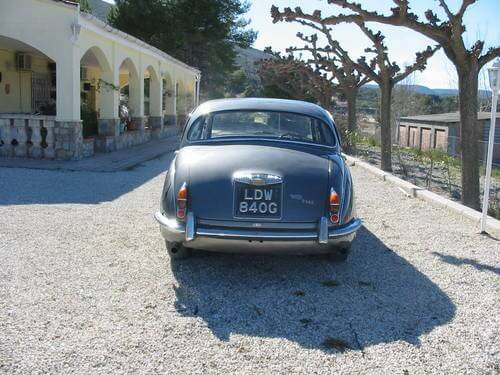 This Daimler V8 250 is located in Spain but delivery is possible. The asking price is £17,750.